The former mayor of the French city of Nice said dozens of people were killed in the attack Thursday. He urged residents to stay indoors. In this video screenshot, people run from the scene after a truck drove onto the sidewalk and plowed through a crowd that had gathered to watch fireworks Thursday in Nice. The former mayor of Nice said dozens of people were killed in the attack Thursday. He urged residents to stay indoors. People in Nice react in the early hours of Friday morning after the attack. A police officer stands next to a body covered with a blue sheet on the Promenade des Anglais seafront in the French Riviera town of Nice. 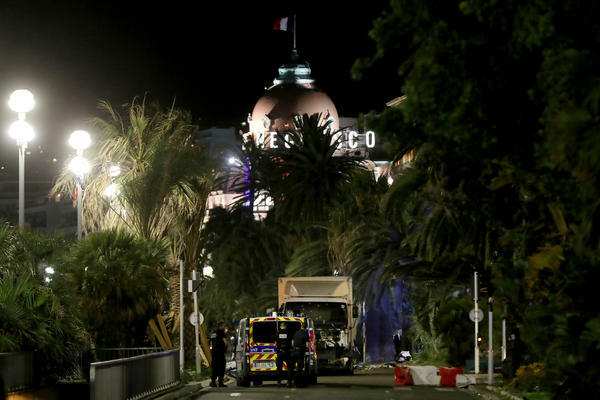 Police officers, firefighters and other rescuers work at the Promenade des Anglais in Nice after a truck drove into a crowd watching Bastille Day fireworks in the French Riviera resort city. A woman cries, asking for her son, as she walks near the scene of Thursday evening's attack in Nice. 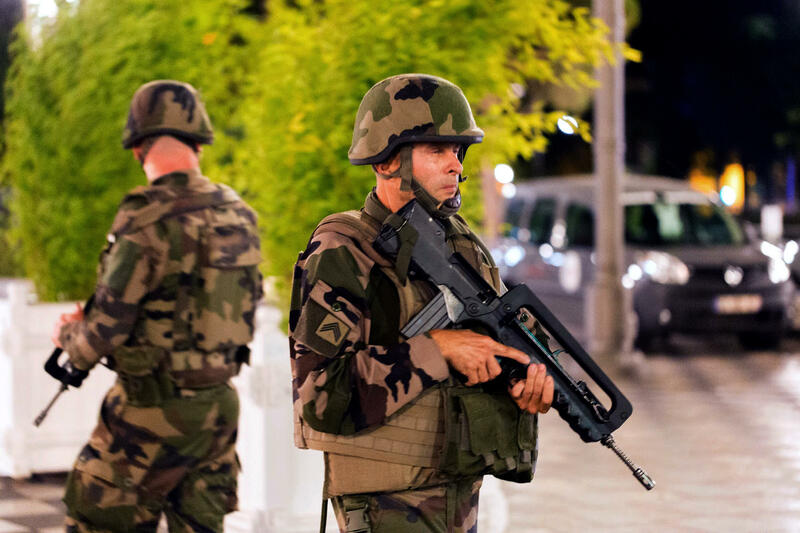 Soldiers stand guard by the sealed-off area of the French resort city of Nice on Friday. Police officers, firefighters and rescue workers at the Promenade des Anglais in Nice after a truck drove into a crowd watching a fireworks display in the French Riviera resort. 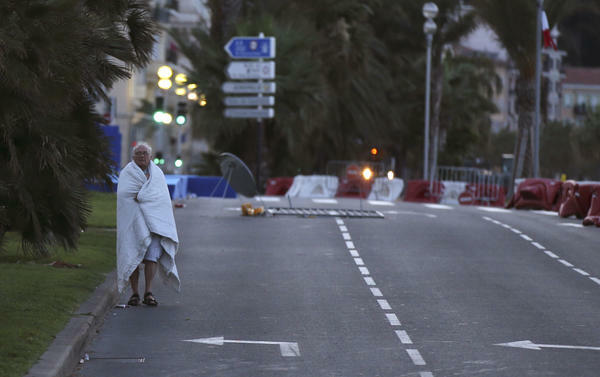 In the early hours of Friday morning, a man walks near the scene of the previous evening's attack. The French interior minister says 84 people have been killed. The four new reported deaths are thought to have come from the list of critically injured. 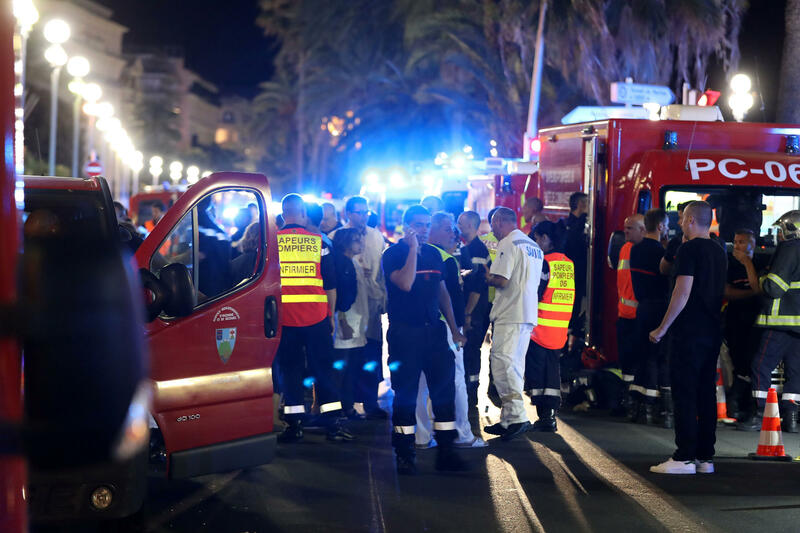 A truck drove into a crowd celebrating Bastille Day in Nice, France, killing dozens of people on Thursday evening. 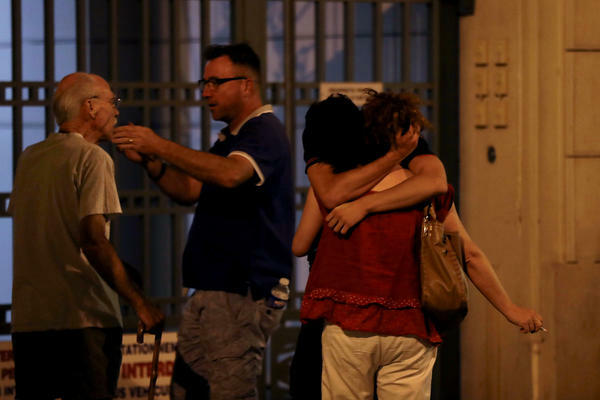 The French interior minister says 80 people have been killed and 18 are in critical condition. NPR's Eleanor Beardsley reports the truck started about a mile away and plowed into a crowd of people watching fireworks on the French national holiday and that the identity of the driver is still unknown. 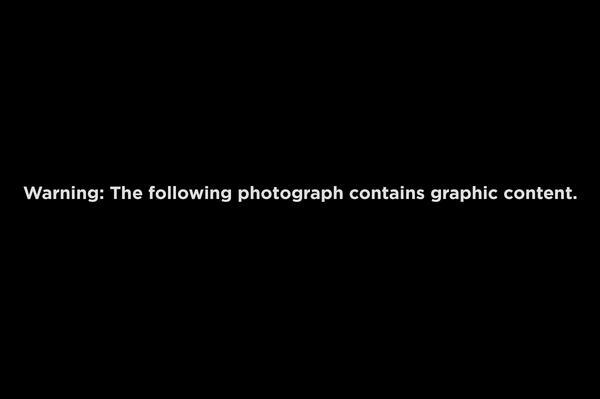 "The driver was shot [and killed]. There may have been a second person in the truck; we don't know yet. "Witnesses describe hundreds of people running in every direction, pounding on doors, asking to be let in. Another witness [reports] layers of bodies piled on each other and people taking tablecloths from restaurants to lay over them." Eleanor also reports that French media say authorities have found papers in the truck that seem to identify the driver as Franco-Tunisian. 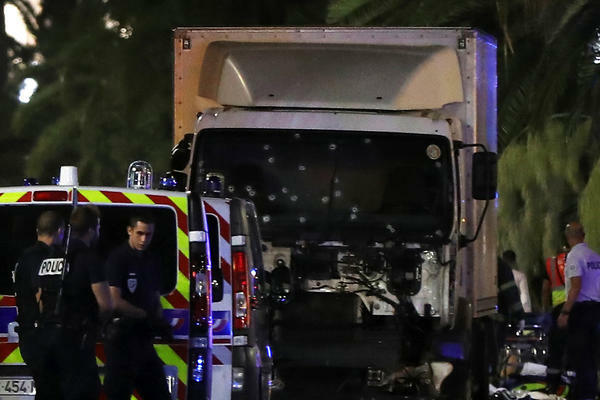 The head of the regional government, former Nice Mayor Christian Estrosi, told local television station BFM TV the truck had guns and grenades inside. He posted a tweet calling on the people of Nice to stand together in solidarity. French President Francois Hollande went to the Interior Ministry's crisis center after hearing of the attack, and the French anti-terrorism prosecutor in Paris has opened a terrorism case. Earlier on Thursday, Hollande told reporters he would not seek to extend the state of emergency that had been in effect in France since a November 2015 terrorist attack in Paris. But in a speech in the early hours of Friday morning, he said, "I have decided that the state of emergency that was supposed to have ended on the 26th of July will be extended three months." Hollande also said he would be calling up those who had formerly served in the French armed forces and the gendarmerie to help relieve police and 10,000 active-duty soldiers. NPR's Dina Temple-Raston reports that no one has taken responsibility, but that domestic and international officials had been warning about an attack on a so-called soft target like this one for months and that officials at a spring meeting of law enforcement authorities had expressed concern about a summertime assault in France. The Associated Press quoted an eyewitness, Wassim Bouhlel, as saying there were "bodies everywhere" after the crash. He told the wire service that after the truck entered the crowd, he saw the driver emerge from the vehicle with a gun, shooting at people. The wire service reported that a journalist for the local newspaper Nice Matin, Damien Allemand, was at the scene, where fireworks had just finished when the truck rammed through the crowd as people were beginning to leave. "An enormous white truck came along at a crazy speed, turning the wheel to mow down the maximum number of people," he wrote online according to the AP. "I saw bodies flying like bowling pins along its route. Heard noises, cries I will never forget." 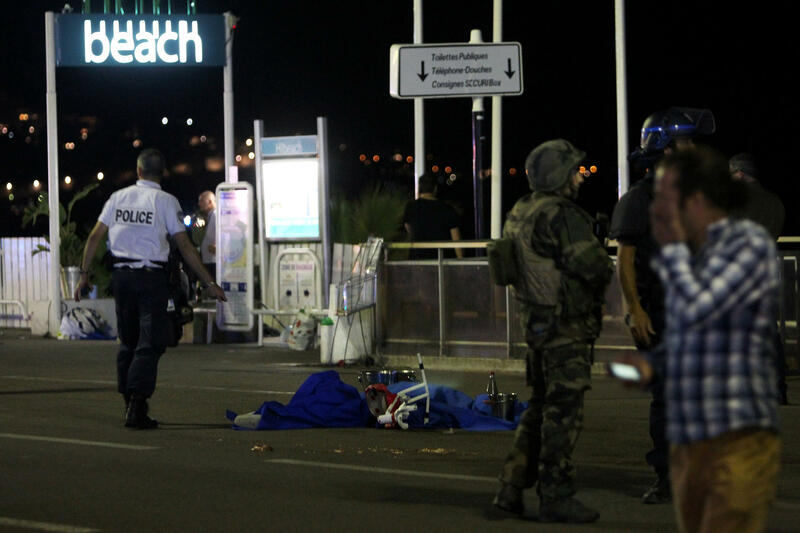 Eric Drattell, an American citizen on vacation in France who witnessed the attack, told NPR he heard gunshots shortly after 10:30 p.m. and saw people diving off the raised promenade onto the beach about 12 feet below. Drattell and his wife hid in a bathroom stall with about a dozen other people before being evacuated by police to a nearby hotel. "I saw a stroller that had been crushed," he told NPR. "There were bodies — bodies and blood everywhere. I'm in complete shock. It's unbelievable carnage." Reuters quoted BFM TV as saying the local government in Nice was asking people to stay inside following the incident. 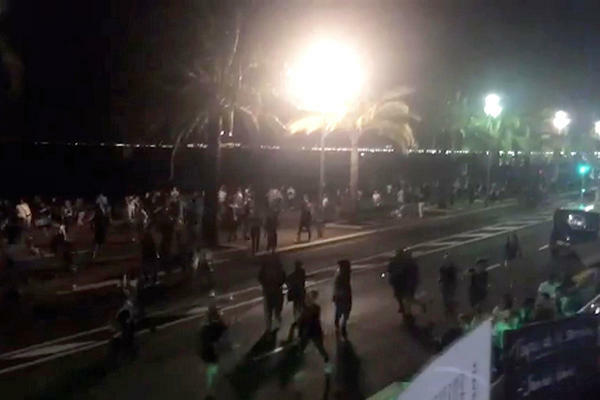 Multiple live videos streaming online from Nice shortly after 10:30 p.m. local time show people running in panic down the city's streets. President Obama has issued a statement, condemning "what appears to be a horrific terrorist attack in Nice, France, which killed and wounded dozens of innocent civilians." Secretary of State John Kerry, who was in Paris on Thursday, said in a statement that the U.S. Embassy there was "making every effort to account for the welfare of U.S. citizens in Nice," and that Americans who are in the seaside city should contact friends and family to confirm their well-being. In New York, Gov. Andrew Cuomo said in a statement that he had asked state law enforcement officials to increase security at airports, bridges and tunnels and on mass transit in response to the attack. This is a breaking news story. We will update this post as details are confirmed.